Today’s Answers From Leadership podcast guest is Ralph Mayhew. Ralph lives in what must be the best place on the planet, the Gold Coast. He’s an Associate Pastor in one of the largest Uniting Churches in Australia, Newlife. He’s been there for eight years and works with a great team of leaders. Prior to this life, he was the Pastor of a group of three wonderful churches in rural Victoria, and before that a Youth Pastor in a regional church. Ralph’s also just finished authoring his first book titled, The Anonymous Leader. Ralph, what else do you want listeners to know about you? Before the interview, I intended to go out shark fishing but couldn’t. I’d hurt my ankle training for a marathon the other day. I’ve been married for over 15 years. That’s really exciting! We’ve got a daughter who’s a firecracker. I’m also a pastor and work in the church. Authored a book, do a bunch of blogging, and just love people. Basically, I think I fell into it. When I was 17, I had a significant moment when my mother told me I was a leader. I think the thing that gave it away was that people followed me. This caught me off-guard. I never thought of myself as a leader. Then I got to thinking about it. I think there’s a lot of technical answers. But I think leadership looks like serving people to help people become who God wants them to become. We facilitate the pathways and environments where people can encounter God. Could you share a leadership difficulty that you’ve faced? There’s been a few difficult leadership situations I’ve faced. About 10 years ago, maybe 12… I was diagnosed with clinical depression. Basically, what happened was that I got really sick. And everything that I put value and security in, I couldn’t do. And I became depressed. How can we reconcile being a leader and a follower of God? This is such a good question. It’s one I’ve wrestled with for ages. Leadership is about death. It’s about leading us to the death. It’s about leading so that leadership is no longer about ourselves. I think that’s how those two things are reconciled. What is your book The Anonymous Leader about? I wanted to put a book in the hands of leaders to help them grab ahold of the Christian or Biblical understanding of leadership. I hope it’s done that. It comes from the premise that as a Christian leader, you can’t lead another person unless you’re being led by Christ. As leaders, we’re to become anonymous. Leadership isn’t about us. We’re the signposts that are forgotten as they reach the destination. Why is it important for a leader to have good character? Character is everything in leadership. EVERYTHING. People will gradually stop following you if you don’t have character. They’ll follow you to begin with because they trust the space you occupy. They don’t trust you. They don’t know you. They trust in the hope you represent. Your role as a leader is to either build trust or you can bankrupt trust. What can leaders do to improve their character if they struggle with character flaws? There’s probably a bunch of things you can do. I think a great thing to do is to get a mirror. This is finding someone who can reflect back who you truly are. You can ask them what they see in your life and what needs to be improved. The other is finding a chair time. Time every day where we spend praying and being with Jesus. Do you have any suggestions on helping us find someone who could be our mirror? Everybody has those people they admire or respect. I think it’s worth the ask. Even if it’s someone you just rub shoulders with through podcasts or a book or blog posts. There’s a lot of talk about leaders needing to create a platform. Do you think every leader should have one? I think every leader is GIVEN a platform by God. Every leader. The role of a leader isn’t to grow your platform or expand your platform. Your role is to steward the platform God has given you. God can take back the platform any time He wants. I think the leader who jumps on the platform God gives and says Hey, look at what I can achieve. Look at how amazing I am. Look at the difference I’m making. It’s only a matter of time before they fall off the platform. And it’s a long fall to take. How do you stop your ego from getting in the way? Having markers along the way. 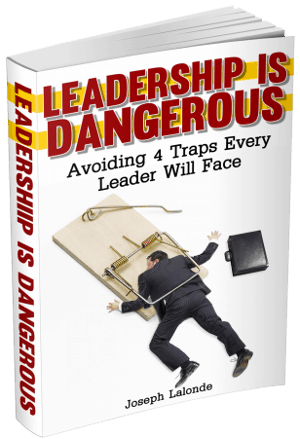 For example, in the book I talk about tensions between 5 components that every leader has. The first one is passion. If my passion is about growing the Kingdom and building God’s platform, it moves towards wisdom. But if I’m doing it just for my sake, I’m being reckless. In my head, I’ve always got this constant thing of when a decision comes up or I react to something, I go: Is this a reckless decision or response or is this a wise response or decision? Can you recommend one or two books a leader should read? There’s 3 at the moment that I’m recommending to everyone. Do you have anything else you’d like to share with listeners today? I think serving Jesus is the most beautiful thing you can do with your life. And stewarding your life so that it moves to that place is the most beneficial thing that when you look back on your years, I’d love it to say that I got to walk with Christ and at His pace. Leaders tend to run ahead instead of keeping pace with Christ. Ralph was gracious enough to give me 2 copies of The Anonymous Leader to give away to 2 lucky readers/listeners. If you want to press your luck and try to win a copy, head over to the giveaway page. 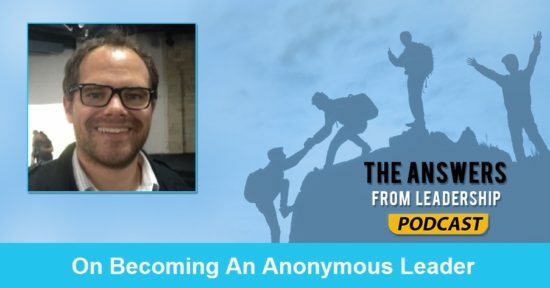 Question: What are you doing to become an Anonymous Leader? Share your thoughts in the comment section below.